Disclaimer: Lost Pages, the publisher of Into the Odd, also publishes my book Wonder & Wickedness. Chris McDowall‘s Into the Odd started out as a game in what I would consider the 0E tradition, but it has evolved into something more distinct, both in setting and rules. The setting is the early modern fantastic. It recalls to me the mystic retro vibe of Full Metal Alchemist, but less manga and more Lewis & Clark. The game itself is pared down to the absolute minimum of rules. This is closer to Searchers of the Unknown than it is to B/X. Character ability scores are strength, dexterity, and willpower, still 3d6 each. Basically, the 3E save categories reworked as abilities. Ability checks (called saves) are only reactive, rolled to avoid danger “from a risky action or situation.” There are no classes and magic powers mostly come from from arcana, a general catchall term for magic items. Determination of starting equipment is rolled into ability scores such that low stats tend to come along with a psychic power or arcanum. My favorite innovation from Into the Odd is the leveling system. Accomplishing certain diegetic goals, in the manner of Xbox achievements, rather than XP thresholds, results in gaining levels. For example, to reach second level (“Professional”), a character must only survive one expedition. There are only five levels. When you unpack the mechanics and terminology, the underlying character details are not so different from D&D advancement (+1d6 HP per level and so forth), but the shift from “high score” (XP) progression to achievements is psychologically powerful. It would be a fun experiment to play B/X using this approach, perhaps extending the achievements up to tenth level and including objectives oriented around establishing a stronghold. Sixty arcana are included, divided into three tiers of rarity or power, standard, greater, and legendary, 20 of each. Unfortunately, only the standard arcana are numbered, making it slightly less convenient to determine greater or legendary randomly, but one can always count down the page so that’s really a just me quibbling. Most could easily be adapted to other fantasy games and I appreciate how concisely and evocatively they are written. For one example, from page 11. 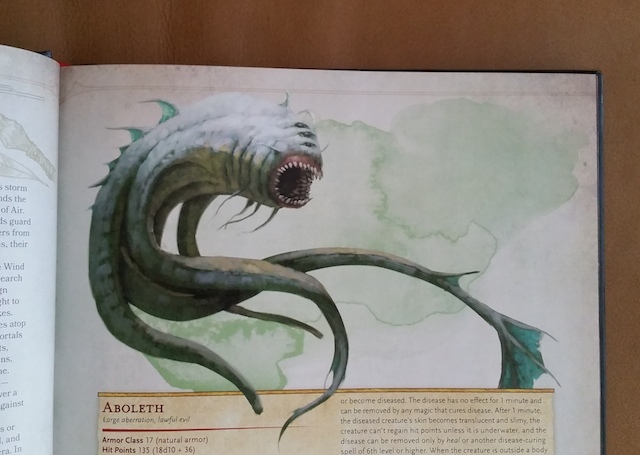 Book of Despair: Summon a 20ft area of tentacles that lash out and grab. Anyone within must pass a str save to break free. The mass of tentacles has 10 hp and is destroyed at 0 hp. In addition to the modular aspects noted above, there are a number of interesting design decisions in the game itself considered whole. For example, there is no attack roll, just a damage roll. This may seem odd to D&D-accustomed eyes, but mathematically the traditional attack roll followed by damage sequence can be collapsed into a single expected damage value (with the possibility set including outcomes of zero), and just rolling damage is not so different from an abstract, high level view, especially with ablative armor (which introduces the possibility of inflicting zero damage). 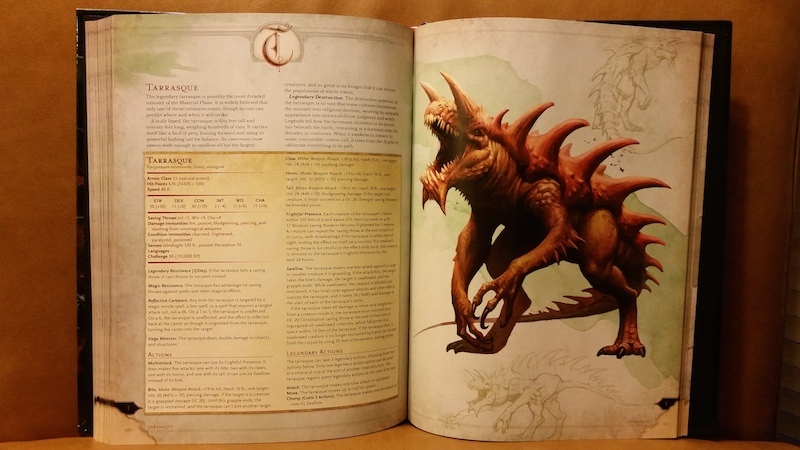 Overall, the book has 2 pages of character creation, 2 pages of rules, 1 page of guidelines for running organizations (which could probably benefit from expansion), 3 pages of 60 arcana, 3 pages of play example, 2 pages of referee advice, 1 page of example monsters, 1 page of advice on treasure, 1 page of trap rules, 1 page of setting background, 8 pages that contain two adventures (one dungeon and one hex crawl), 2 pages detailing a town, and the Oddpendium (14 pages of random tables including things like insane council decisions and weird creature inspiration). Definitely worth a look for anyone interested in rules-light approaches to fantasy games focusing on exploration. Buy Into the Odd at the Lost Pages store. Note that come 2015, it may be unavailable for some period of time due to EU regulations. This entry was posted in Reviews on December 27, 2014 by Necropraxis. Sorcery rules, spells, magical catastrophes, enchanted treasures. 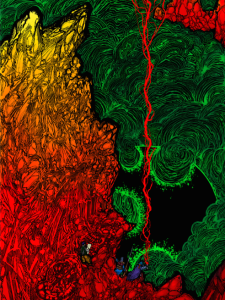 More from Paolo here, including another image sample. It will only be available in this form until the end of december due to EU regulations. We can’t guarantee anything, but we are working on a solution to keep it available after that point. 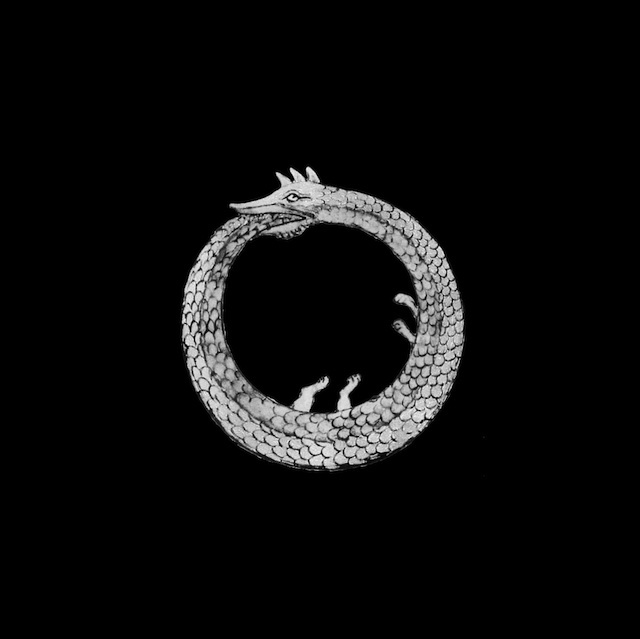 There may at the least be some period of interruption come 2015. 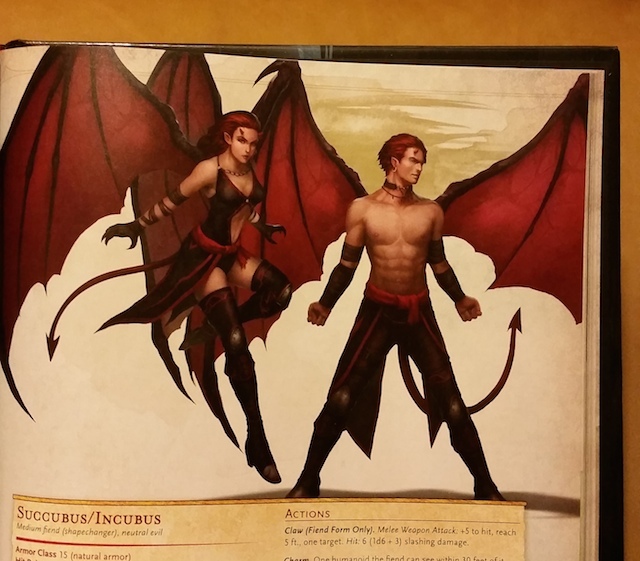 This entry was posted in Spotlight and tagged Wonder & Wickedness on December 21, 2014 by Necropraxis. 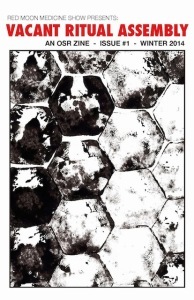 Vacant Ritual Assembly (VRA from hereon) is a zine by Clint K. primarily about his LotFP campaign. This format seems ideal for sharing personal campaign material with a wider audience. Zines are more professional and put together than blog posts, but not ambitious enough usually to get mired in development hell. They seem to naturally lend themselves to non-comprehensive treatments, in contrast to a setting or megadungeon publication. I have been unsure for a long time about whether or how I might share my Vaults of Pahvelorn campaign materials, but I am so impressed by what Clint has put together here that this will likely be the way I release Pahvelorn. Other than an interview with Chris M. about Into the Odd (which is also enjoyable reading), pretty much everything within is a useful game tool. My favorite part is the ghoul market, which, along with being atmospheric, also solves elegantly the treasure economy problem that all treasure-for-XP referees must confront in some manner. Almost any cemetery of significant size will contain a passage to the Ghoul Market. The mark of the White Ankh on a tomb or mausoleum indicates that the edifice serves as a gateway. 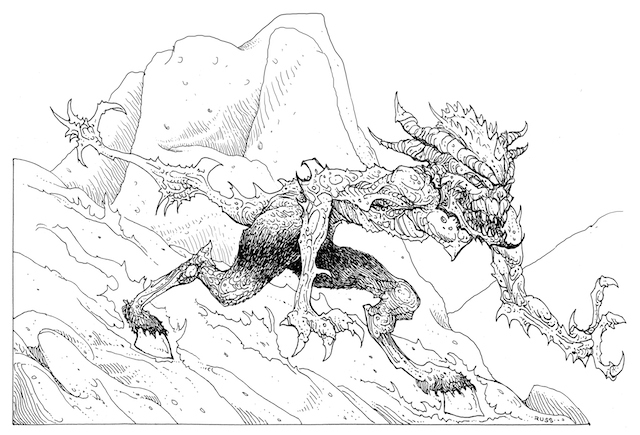 The market is a form of mythical geography where PCs can buy a small number of randomly determined magic items between games or raise the dead by engaging the services of the skinsmith (which may result various grim alterations such as a character’s head being replaced with that of a bull). Oh, and “essence” (charisma points) are also accepted as currency. These six pages + the curiosity shop worksheet are top shelf supplement material. 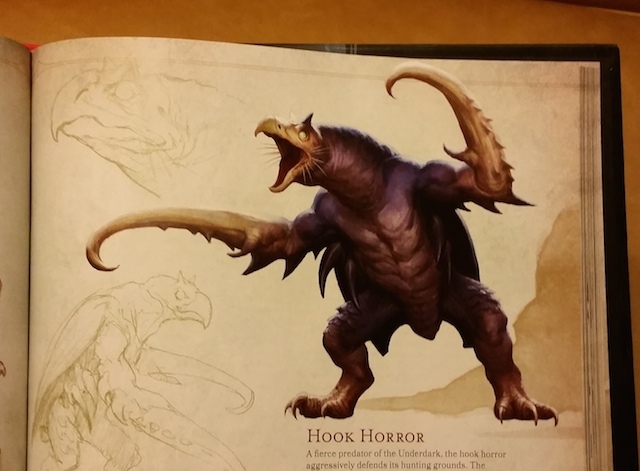 As might be clear from the above description of the ghoul market, the setting implied by VRA is slightly more magical than the default LotFP expectation, shaded toward something like classic Diablo, which I like. Additionally, there is a half page of house rules, some external media recommendations, a minor firefly god (Luminari, Lady of the Golden Lamp), a flooded village adventure, and a mansion map (“Greycandle Manor”) with unfilled key. I gather this last item was an undead lair that was cleared out and claimed as a home base by the PCs in Clint’s game. Overall, the tone is creative and flavorful without being turned up to 11. VRA is available in print or pay what you want PDF. The ghoul market alone is worth your time. Highly recommended. 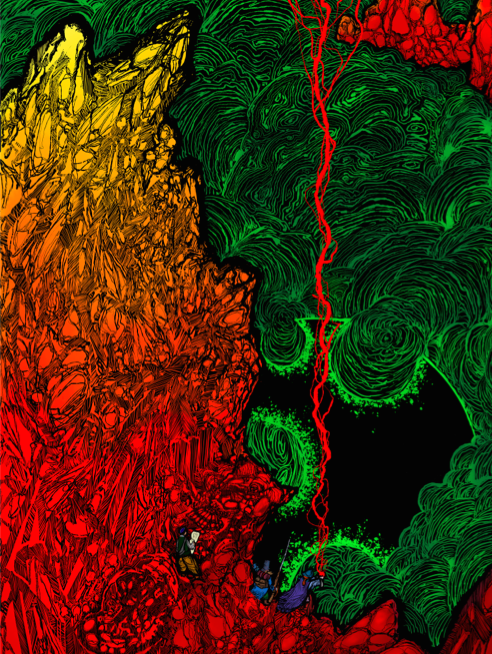 This entry was posted in Reviews and tagged LotFP on December 18, 2014 by Necropraxis. 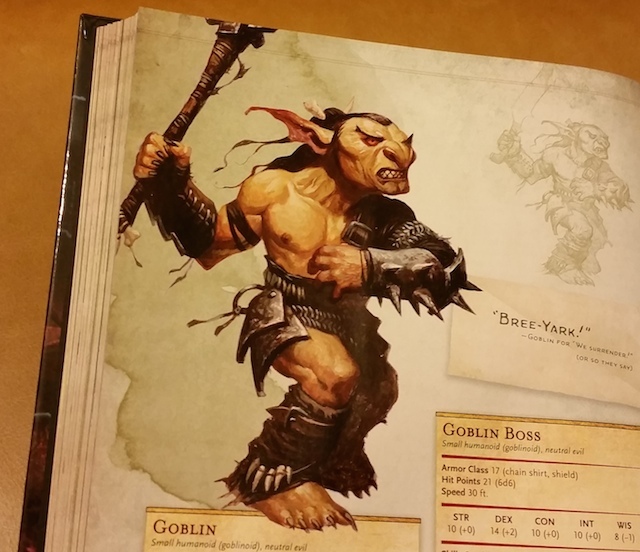 Is this not just the new Basic D&D? Not quite. Ability scores: 3d6 down the line. Rearrange as desired. Bonuses from B/X (page B7), because the bell curve distribution of +1, +2, +3, with max 18, makes bonuses more special than the 5E linear increase. Ability checks: roll 1d20 <= score (lower better). Skill checks: roll 1d20 +bonus & +proficiency if proficient (higher better; vs. DC 10 most of the time). Recovery and dying: re-roll HP during each downtime. Save or die when reduced to zero HP. 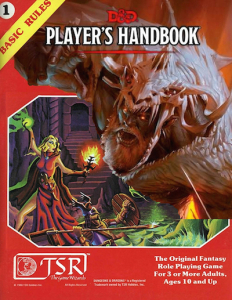 Classes are the fighter (HD d8), magic-user (HD d4), and thief (HD d6) from B/X but interpreted as makes most sense in light of the below referenced 5E rules. Use fighter XP progression for all classes (page X6). Magic-users begin with proficiency in daggers and no armor. Spell progression is from B/X (page X6). Roll three starting spells randomly from B/X or some other spell list. You can pick a spell too if that’s what you spend your first feat on. Spell casting in armor without proficiency is impossible. Thieves begin with proficiency in club, dagger, staff, short sword, sword, short bow, light crossbow and light armor. They also start with proficiency in dexterity (stealth), strength (climb), intelligence (search), backstab (or sniper), and thieves’ tools. Backstab is only for surprise melee attacks and deals +1d6 damage per point of proficiency. (But see also the sniper feat.) Distraction + successful stealth check = hidden. Attack from hiding = surprise. Situational modifiers: Use 5E advantage and disadvantage. Armor: Ascending AC and armors from 5E (PHB page 145). If you do not meet the heavy armor strength requirements, you take disadvantage on most physical tasks (rather than the speed modifier suggested by the 5E rules, because that does not really come into play unless you are counting squares). Shields: proficiency with medium armor grants the ability to use shields passively. Otherwise, a shield is just a weapon and you need to spend an action to get any defensive benefit. Weapons: From B/X (damage on page B27). Attack bonus: apply your proficiency bonus to attacks with weapons for which you have proficiency. Finesse weapons: (dagger, stiletto, rapier, etc) use the dex bonus rather than the strength bonus for attack and damage. Initiative: group d6, highest wins. Bonus spell slots can be used to prepare spells of first level or any level that you can otherwise cast. 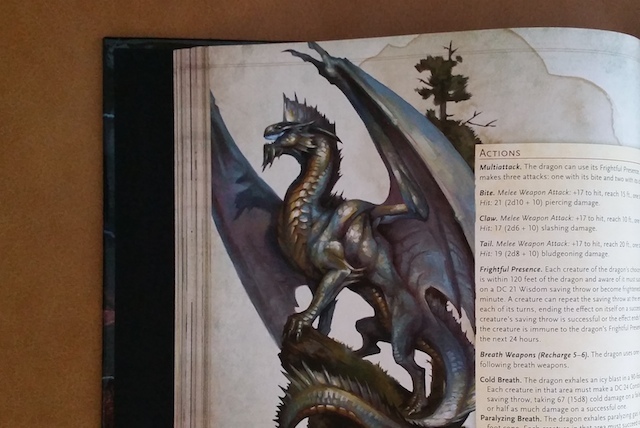 This entry was posted in Rules and tagged B/X D&D, D&D 5E on December 16, 2014 by Necropraxis. 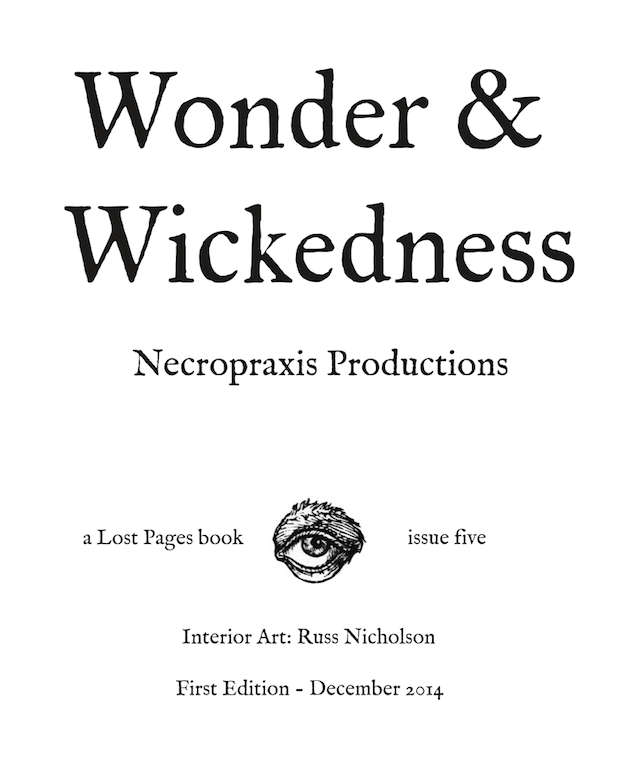 Soon, if all goes well, Lost Pages will release my sorcery supplement, Wonder & Wickedness. The text is done and layout progresses, about 90 A5 pages. We are working on a small number of hand-bound hardcovers as well. The spells and several of the enchanted items have appeared before on this blog, though I have modified a few of them. All of the catastrophes and the bulk of enchanted items are new. We do not have an official release date yet, but hope to have this available before the end of december. 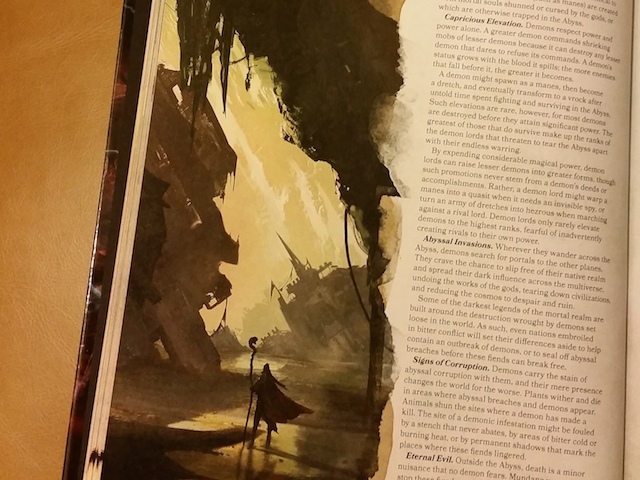 This entry was posted in Spotlight and tagged magic-user, Wonder & Wickedness on December 13, 2014 by Necropraxis. 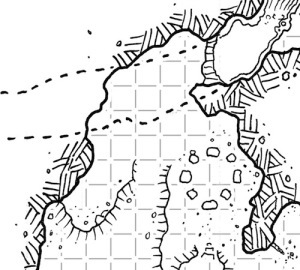 Paul S. asked (private circle share) about 5E rules for setting traps. Some traps, like setting a bucket of paint on a door that is ajar or scattering marbles, do not require any special rules. You set them, and they trigger if situationally appropriate. They can be handled entirely by description and ruling. Setting more sophisticated traps, such as a concealed snare, present an opportunity for leveraging existing mechanics to support character abilities that are not explicitly handled. 5E already has rules for crafting using tool proficiencies. 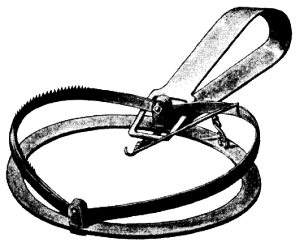 Thus, setting a trap requires trap-maker’s tools, which can be improvised. Simple traps can be set in one dungeon turn, but more complex devices may require more time. If the crafting is possible but uncertain in some way (such as under time pressure), require a crafting check (probably DC 10, but adjust as necessary). A set of trap-maker’s tools is a small kit containing cords, wires, springs, and so forth that functions similarly to a healer’s kit. It counts as one significant item (if using simple encumbrance), and is exhausted using whatever rules are in effect for healer’s kits (in the 5E PHB, this is 10 uses, but I might use an ammo die). Tools can be improvised from local detritus, standard, or masterwork. The referee must rule whether tools can be improvised in a given situation. If tools are improvised, saving throws versus trap effects are made with advantage. If masterwork, they are made with disadvantage. Trap DC works like spell DC: 8 + ability bonus + proficiency bonus. Crude mechanical traps (such as rigging a swinging log) use dexterity. More sophisticated traps based on specialized knowledge (such as crafting a poison needle mechanism) use intelligence. Example 1: first level character without proficiency, using improvised tools, with dexterity of 12 (+1). Trap DC is 9 (8+1), victims make saves with advantage (due to improvised tools). Example 2: first level character with proficiency (+2), with dexterity of 15 (+2), using standard trap-maker’s tools. Trap DC is 12 (8+2+2), saves are unmodified (since standard tools were used). 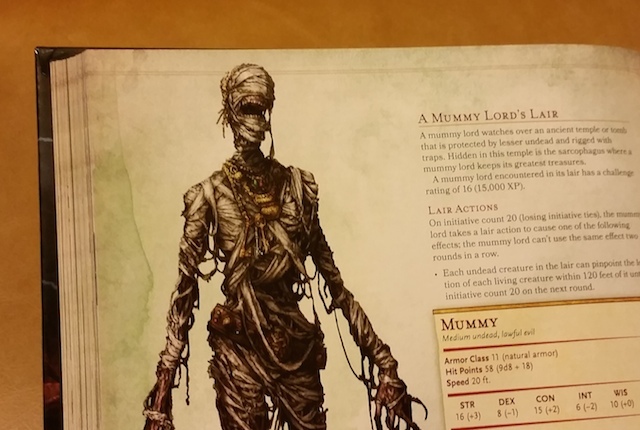 This entry was posted in Rules and tagged D&D 5E on December 9, 2014 by Necropraxis.